In an unprecedented move by a Western Christian leader, Archbishop of Canterbury Rowan Williams has praised British Muslims for bringing back religion and ethics into public life. "I think Islam has made a very significant contribution to getting a debate about religion into public life," Williams, the leader of the Anglican Church, told the Muslim News. "And I think it's very right that we should have these debates and discussions between Muslims and Christians and others in public." Britain is home to more than two million Muslims. This is the first time a Western Christian leader thanks Muslims for bringing back religion to a secular Western society. Last November, Head of Vatican's Department for Interfaith Contacts Cardinal Jean-Louis Tauran praised Muslims for bringing religion back into the public life in Europe. 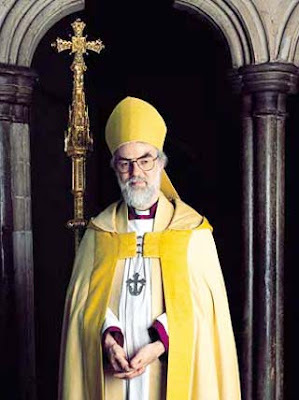 Williams, the leader of the Anglican Church, lamented the unfriendly atmosphere for faith in British society. "If we are not allowed as religious people to talk and argue about these issues in public then I think society has become a rather unfriendly place for religious people and that's not helpful change." Williams, criticized the West's Christian leaders for failing to bring their societies away for the devastating and dominating materialism. "(They were unable to) turn around our society which was being driven by materialism," he said. "(I hope) to see leaders listening specifically to the more ethical challenges that faith brings." Williams called for bolstering Muslim-Christian cooperation to serve the well being of the whole community. "The idea that what's good for me and what's good for you belongs together," he said. "Both Muslims and Christians have a very strong sense of God's will being done in community, when we really follow the needs of the community and work for one another on that in the will of God." The Anglican leader, however, admitted that the Christian Muslim Forum, which he initiated in 2001 for brining UK Muslims and Christians together, had not reached the grassroots so far. Williams has repeatedly defend faith schools in Britain as contributing to the promotion of religious tolerance. He asserted that faith schools are already proven in their ability to reach out across faith boundaries and help to build confidence in minority communities.